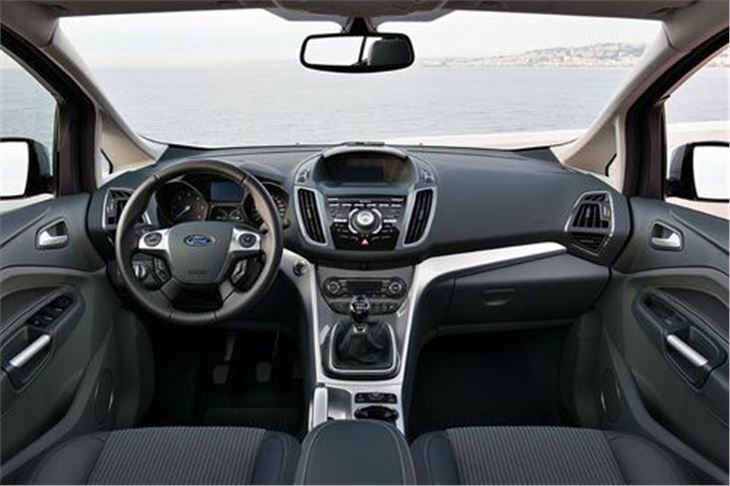 Unlike the previous version, the new C-Max is two cars in one: a 5-seater, and a 7-seater. 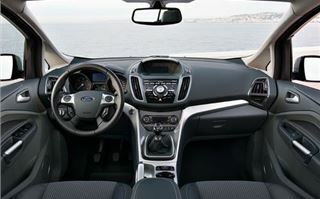 Significantly, they are the first Fords in the World on a new ‘C segment’ platform that will eventually form the basis of ten different models, of which no less than 2,000,000 a year are planned to be made. So, actually, it had to be good. Yet even drivers used to the fluid manner in which modern Fords like the Mondeo and S-Max seem to flow from corner to corner were surprised by quite how well this relatively tall and boxy ‘Multi Activity Vehicle’ goes, rides and handles. It’s soft and supple on its 215/50 R17 tyres, yet steers remarkably accurately, resists both understeer and oversteer to remarkably high levels, and imposes no significant effort on the driver. 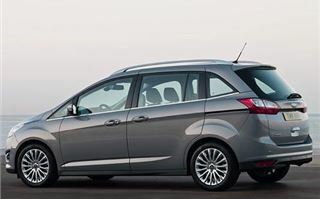 The 5-seater is almost as easy to get in and out of as the original C-Max, yet now has small bolsters on the sides of the seats that impede this process slightly. 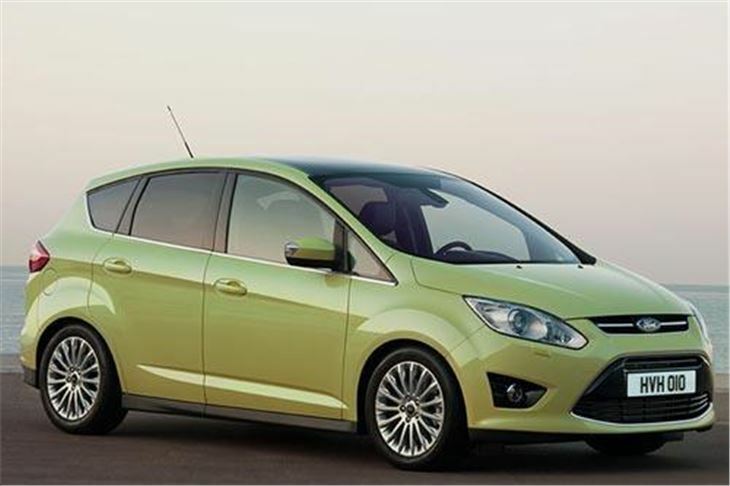 Happily, though, the fact it is designed to be either a 5 or 7-seater has not impinged on the roominess in the front. Behind, the narrow centre rear seat still folds forwards and the two outer rears can be slid diagonally six inches back to offer more legroom at the expense of luggage space. Leave them where they are and there’s a very useful 475 litres of luggage space if you don’t specify the optional space-saver spare, and 432 litres if you do. 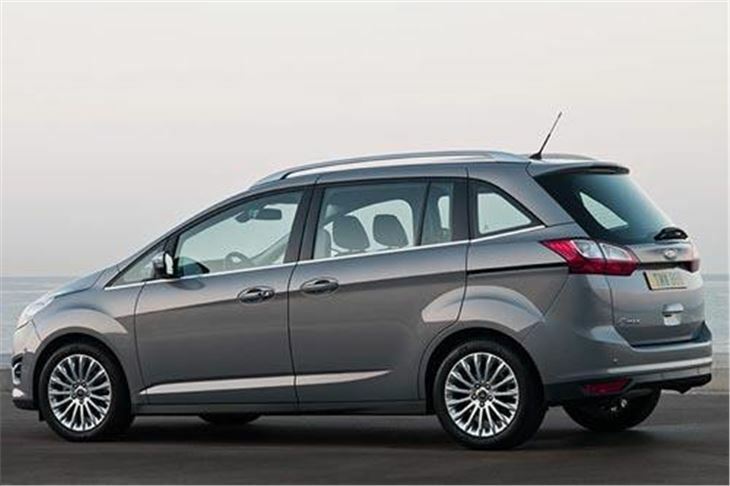 The 7-seater Grand C-Max is exactly the same in the front and only changes from the driver’s door pillar backwards. The two rear side doors slide, and the centre rear seats initially look much the same. But flip the right-hand squab forwards and you can quickly fold the centre seatback down, then hinge the whole thing over into the base of the right-hand seat. That then makes it a 6-seater, but the advantage of this is the same as you see in many 7-seaters parked outside schools waiting to pick children up. While ISOFIX tethered child seats can remain in place on the outer seats, the older offspring can nip through between them to take their places in the back. There’s not a lot of space for them there, but this can be increased by sliding the centre seats forward, and it’s enough at a pinch. From memory, about the same as in a Toyota Verso. Of course, there has to be a compromise, and there’s almost no room at all behind the rearmost seats. Just 90 litres maximum, assuming you opt for the Tyrefit kit rather than the spacesaver. But if you’re only carrying five, you can flip one of the rearmost seats down to create luggage space next to the rearmost passenger. Flip all the seats down and there’s between 1,684 litres and 1,742 litres of loadspace up to the roof. Ford sees the Grand C-Max as a car for young families with one, two, or three children and the occasional need to carry a couple of their friends. 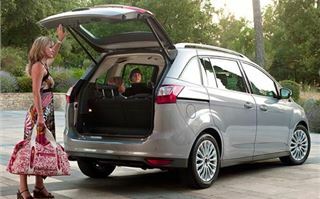 By the time the kids reach their teenage years it will probably be time to move up to an S-Max or Galaxy (or Sharan or Alhambra). But the convenience of the short length and the wonderfully agile way the car drives makes it a better bet than a family battlewagon for the first ten years or so. And the car has what designer Martin Smith describes as a “premium feel”. By which he means a higher quality of ambiance. The piano black Sony DAB radio/CD player with intuitive controls is particularly nice. 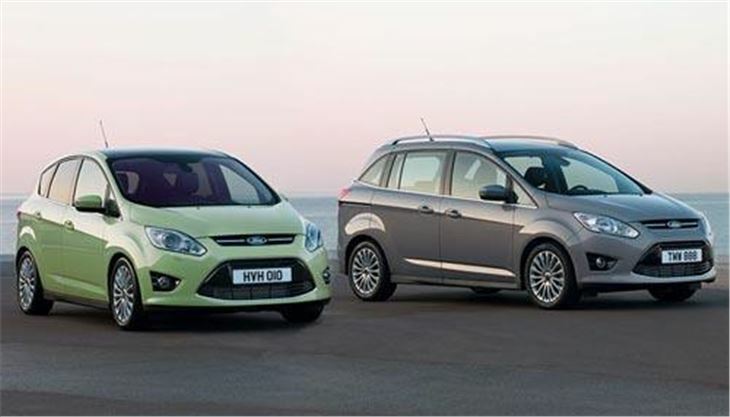 In total, the new C-Max and Grand-C-Max come in no less than 24 different engine, transmission and body combinations. Sensibly, Ford of Britain won’t initially be inflicting all of them on us unless sufficient numbers start clamouring for more. We’ll get base 1.6s with 105 or 125PS, 1.6 TDCI 115s, 1.6 Ecoboost 150s, and 2.0TDCI 140s with either 6-speed manual or 6-speed Powershift transmissions. 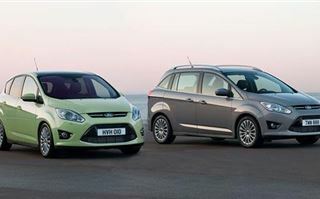 The C-Max 1.6TDCI creeps in under 120g/km, so is £30 tax, the Grand C-Max 1.6TDCI is under 130g/km, so £90 tax. While the 2.0 TDCI manuals are under 140g/km, and the 2.0TDCI Powershift is under 150g//km in the C-Max, but slightly over in the Grand C-Max. Still under the vital 160g/km for company cars, though. Petrols, too, all come in under 160g/km, whether 105PS, 125PS, 150PS or 180PS. 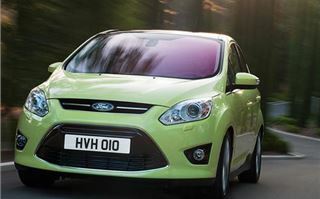 In 2011 or 2012, there will also be an all new, ultra low emission 1.0 litre 3-cylinder Ecoboost petrol engine that Ford will be hoping to get under the magic 100g/km CO2. This is the first appearance of the 1.6 Ecoboost in a Ford. The new engine employs both direct injection and turbocharging to provide very useful pulling power at low rpm, good economy, relatively low CO2 for a petrol engine, and the ability to rev if required. The low down torque was very welcome, similar to PSA’s 1.6THP 150, making it an extremely sweet and agreeable engine to drive. 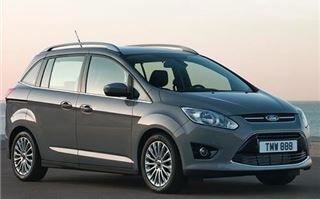 We also got our hands on a 2.0TDCI Powershift in the Grand C-Max body and this proved to be surprisingly sublime. You expect a hot hatchback to turn in and hang on through a long corner. You don’t expect a mini MPV to, yet the Grand C-Max does, not only putting cars like the Scenic, Zafira and Verso to shame, but also the best of the current crop of ‘C segment’ hatchbacks, including the present benchmark Focus. 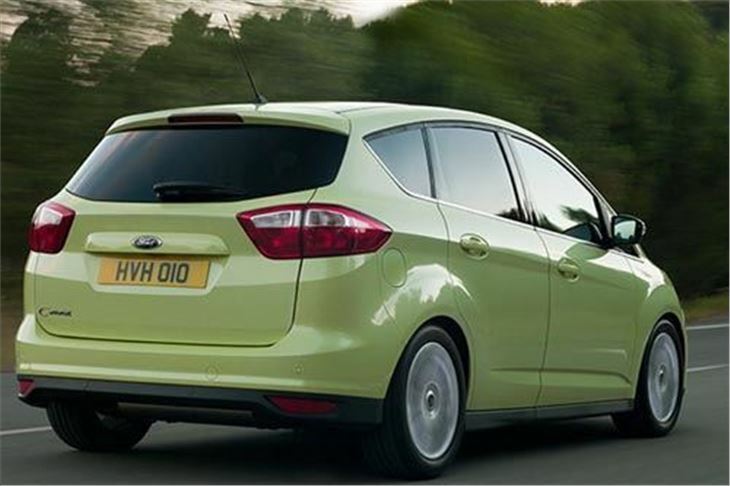 Ford puts this down to detailed tuning of the ‘control blade’ suspension and a new ‘torque vectoring differential’, which uses the brakes to give the effect of a limited slip diff. 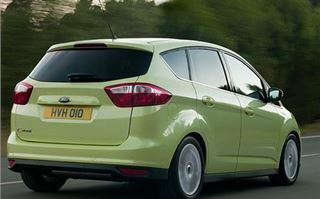 That’s why, when the new Focus lands on our shores early next year, it’s likely to be sensational. 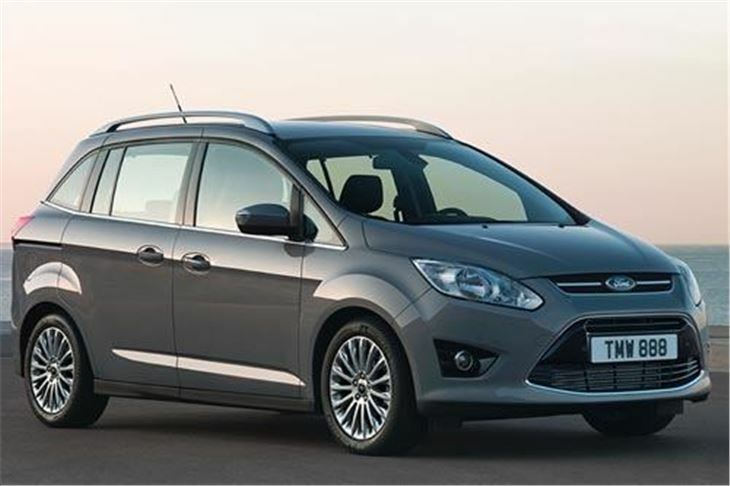 For the new C-Max Ford has improved general specification levels. You can see what you get on the different versions in the specs section. There are also some useful options and option packs. Worth mentioning here are the cruise control with speed limiter, BLIS Blind Spot Eliminating Mirrors, rear parking camera, park assist (which self parks the car for you in a tight space), electric tailgate, adjustable rear seat watching mirror, driver controlled rear child locks, hill start assist, Tyre Pressure Monitoring System, piano black Sony DAB radio/CD, Easyfuel misfuel prevention, and of course, seatback picnic tables. The new electric power steering has no separate settings for comfort, normal and sport, but, with fewer turns lock to lock and a nicer feel, doesn’t need them.